Local food producers in Northwest Michigan are entering an era of collaboration thanks to the emergence of the Grand Traverse Food Innovation Hub. The food hub is an important step toward a more connected and cooperative local food community in the region and is in the early stages of bringing diverse local food companies together to share a workspace and possibly more, if everything goes according to plan. The goal of the Grand Traverse Food Innovation Hub is to make local food entrepreneurship plausible for small-scale and start-up producers, as well as encourage innovation through the sharing of information and ideas. After five years of planning and hard work from local food stakeholders, the food hub is currently in the process of leasing space to local food producers like the Michigan Hops Alliance, the Redheads, Blue Moon Cheese, Eaton B Goode, The Raw Juice Co., Michigan Venison Co., and others. The idea for the food innovation hub evolved from casual meetings between local food stakeholders, a group who would eventually formalize their association by forming the nonprofit organization the Grand Traverse Foodshed Alliance. “We were a loose-knit group basically of volunteers who were interested in food systems and economic development in the food system. We were all coming to the table and thinking about ways of pushing back against the trend that’s happened over the last 20 years where everything in the food realm has gone toward increasing levels of consolidation,” says Rob Sirrine, a Michigan State University community food systems educator and founding member of the Grand Traverse Foodshed Alliance. The Grand Traverse Foodshed Alliance partnered with Cherry Capital Foods, a regional food distributor, to get the food hub off the ground. Both organizations operate out of the food hub facility which is 12,000 square feet and has space for nine separate local food producers. Each unit has individually metered gas, electric, and water, and the building has shared dry storage, cold storage, and freezer space. Sirrine says offering this type of plug and play set-up helps new producers get started and increases their chance of success during the challenging start-up phase. “They can take what capital they have and invest it in other areas that will help grow their business,” says Sirrine. “Our goal is that these business become like the next Cherry Capital Foods. Hopefully they’ll grow to the point where they go out and purchase their own warehouse,” says Sirrine. Although the future of the food hub looks promising, Sirrine says it took a lot of work to get to this point. Finding the right location was especially challenging and involved a bit of trial and error. Sirrine and his colleagues originally planned on rehabilitating the former commissary at the Traverse City state mental hospital, a building which is part of a huge redevelopment project in Traverse City. The group even received grant funding to rehabilitate the building, but remediation costs were too great to move forward. Fortuitously, around the same time the first building was deemed unfit for the hub, Cherry Capital Foods was looking to expand their square footage and had found a 12,000 square foot building located at 1610 Barlow Street in Traverse City. 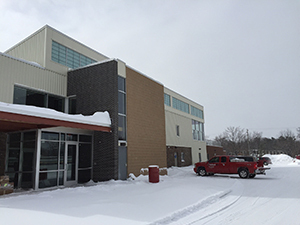 The CEO of Cherry Capital Foods, who is on the Grand Traverse Foodshed Alliance Board of Directors, offered to share their building with the food innovation hub. The new location, although a vast improvement on the commissary building, was still an old building with issues that needed to be resolved. “It’s taken longer than we anticipated to get the building done because it was a rehabilitation of an old building, so you never know what you’re going to find. There’s no real architectural renderings of the building so we didn’t know where the water lines were or the electrical lines. It took quite a bit more time to get completed, but now we’re at the point where we are visiting with folks who are interested in becoming tenants and working out their lease agreement. So it’s moving time right now,” says Sirrine. Gradually, the growing food innovation hub on Barlow Street is becoming a place for local food entrepreneurs to brainstorm, collaborate, and innovate— or so Sirrine and other local food stakeholders hope. They also envision the food hub as the first step in a larger local food innovation movement in Northwest Michigan.